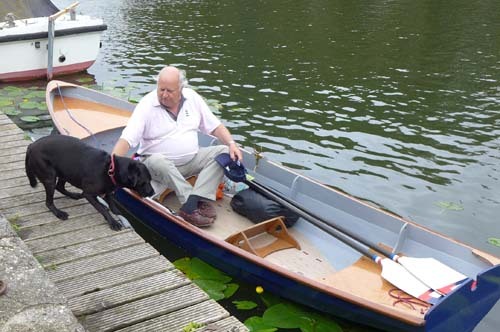 Our Clerk, Major Jollyon Coombs, is now famous for his activities performed in aid of charity and particularly his rowing. In 2003 he walked from Amman in Jordan to the rose city of Petra, raising £13,000 for charity. In 2005, he walked, along with Liveryman Jane Way, from Cadiz to Gibralter, and raised over £15,000 for charity. But it was in 2009, that we first saw the efforts of Jollyon, the oarsman. He rowed the length of the river Thames from near its source at Lechlade to the jetty of HMS President near Tower Bridge in London. He achieved this in a boat he had built himself from a kit, and raised £26,000 in the process. Again in 2014, he rowed the route of the Great Glen across Scotland in another boat that he built himself and raised £24,000 for charity. And so to 2018. 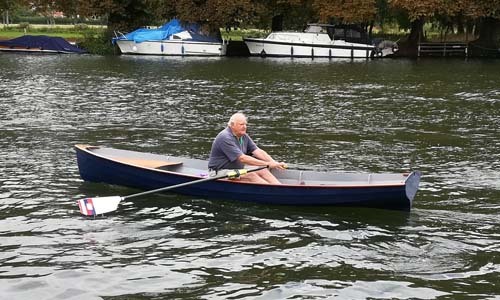 Jollyon decided to do one more rowing challenge and at the age of 72, he planned to row 72 miles along the river Thames, but this time he started each day at Pangbourne College, his old school, and rowed up and down the river for a week until he totaled the 72 miles, well a little more, actually. His sponsorship has so far, (as at 1 September), earned £19,000 including gift aid. The charities he is supporting this year are The St. Paul’s Cathedral Chorister Trust and our own Feltmakers’ Charitable Foundation. Jollyon trained for the event by rowing increasing distances on the stretch of river that he would eventually use for his challenge. For each of the seven days of his challenge, he returned home and filed a report of the day, illustrated by photos and even some video taken by wellwishers who visited and supported him. This report was emailed out to Liverymen so they could follow his progress. It became a continuing theme of the challenge, to see what colour shirt he would wear each day. Here are the highlights from Jollyon’s daily reports. Just back from the river. My report for day one, as follows: – wind, moderate showery rain but not too hot; what a terrible day to start the row. However, up till about 1100 hours it was all fine and I made the decision ( a bad one), having already rowed 3 miles, to go up to Goring a distance of a further 6 mile round trip, but having got to the bridge – stopping to take on water and half a banana – the wind rose from the south west to about 25 knots, making the return journey of 3 miles a nightmare – with the wind on my nose and every meter forward taking a great deal of strength and reserve energy. The return journey took about twice as long as going up and I was very grateful to take a lunch break on reaching the Pangbourne College boat houses. After lunch the wind was still quite strong but the final leg for the day, a further one mile trip was without incident. The task was now complete for day one – 10 miles rowed. A reasonably uneventful day on the water – wind gentle (mostly), rain slight, temperature perfect. The highlight for today was a visit from the Fourth Warden – Neil Edwards and Simon Millar who joined me for lunch at the Swan and, even better, paid for it – I am most grateful for their support – thank you. 11 miles covered today. Tomorrow I shall be wearing ‘blue’. A wonderful day on the water, almost everything perfect. 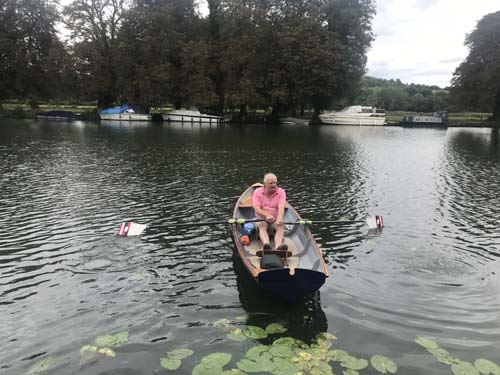 I rowed to Goring first thing and returned to Pangbourne (6 miles) for a break , out of the boat, followed by a further 3 miles to the islands and back. Peter Grant and Richard Hawkes joined me for lunch at the Swan – and again very kindly bought me lunch – thank you both for your support. A further 2 miles rowed after lunch. I have watched a baby Crested Grebe grow from about 4 inches to one foot over the last 5 weeks – always in the same place and always noisily asking for more food, very long suffering parents!! 11 miles covered today so running total now 32 miles. For those who follow their Clerk’s antics – I was wearing blue today!! Expecting a less than helpful wind today I decided to start by 0800 hours and get the row done before it all turned sour on me. However, the Gods looked kindly on your Clerk and favoured me with lovely conditions all round. I rowed all the way to Goring Lock (9 miles return) and stopped early for lunch. I do find 3 hours sitting in one position extremely trying for my legs, bottom and associated muscles and nerves – 2 hours is really the limit, without a stretch and walk. Catherine and Geoffrey Farr + Bill Gammell joined me for lunch at the Swan – for which I thank them and for their support. After lunch I rowed a further 3 miles to the islands and back, making a total of 12 miles for the day. Now over half way with a few miles in hand should it all turn pear shaped later in the week. Today was all about rain and lunch at the Ferry Boat Inn at Whitchurch – The Swan had drain problems that I hope will have been fixed by tomorrow. Your Clerk did a morning’s work and then set off for the river at 1200 hours, by which time the rain had stopped and I polished off 3 miles before lunch at 1330 hours. 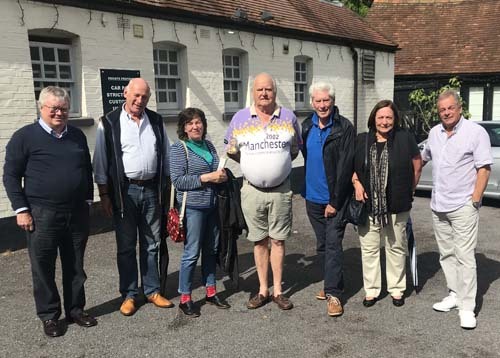 For lunch there were a great number of people, wives, etc, today: Nick Heal, James and Ros Cushing, Bill Gammell, Jane Way, Alex Flower and the long suffering Ruthie Coombs – thank you all for your support. I returned to the river at 1515 hours and set off for Goring. 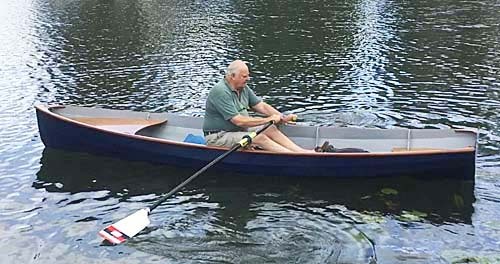 There is nothing more irritating than to row upstream with the wind on your nose, for 3 miles – but, in the sure knowledge that the wind will, of course, help you on your return journey – only to find that the wind does not reciprocate in this way, but falls away, leaving you far away from home with no wind to help you back, Grrrrrrr. However, I was back by 1800 hours having covered 9 miles today. That makes a total of 53 miles so far – 19 to go. What a wonderful day – Temperature and wind perfect with no rain, if only all the other days could have been like this!! The Clerk is holding up well and the Swan pub was back on line to provide another excellent lunch, where I was joined by Nigel Macdonald and a couple of Army friends – thank you for your support. 10 miles rowed today – wind rising after lunch – so the early bird technique works well; only 9 miles to go and tomorrow I am being joined by Simon Wood, who will row with me and alleviate what has become a rather repetitive programme for me over the last five weeks. Day 7 – the final day. Well, It’s all over, I finished the 72 miles at 1230 hours today (but actually did 73 – because it fitted into the schedule better). Simon Wood and his father Edward, together with Robin Pugh, joined me for the final row to Goring railway bridge in their Thames Tub, which is nearly 100 years old. Afterwards three dedicated women of our families joined us for lunch at the Swan Pub. I am enormously grateful to all of you in the Livery and my friends outside the Livery, who have supported me so supremely well in this effort of mine, and have contributed so kindly to the money raised. The weather was sublime in every way on this last day and although I am very tired, I could do it all over again (but won’t!!). Jollyon’s dog, Molly, gives technical advice. Still not too late to sponsor Jollyon and make a donation to his chosen charities – The Feltmakers own charity and the St. Paul’s Chorister Trust. His target is £20,000, so not that much to go. All of you who have been meaning to make a donation but haven’t yet got round to it – why not do it now?